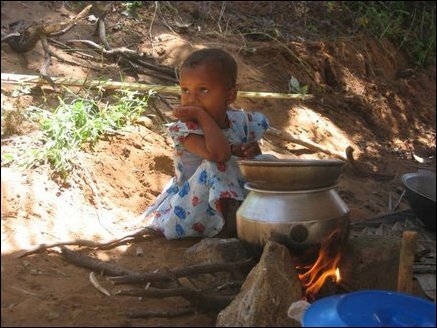 A little girl in a welfare camp in Thampattai in Eastern Sri Lanka sitting in front of a pot of rice being cooked at 3pm in the afternoon. 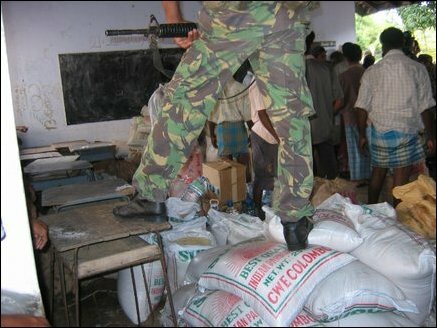 There have been complaints of insufficient aid reaching the residents of this camp. 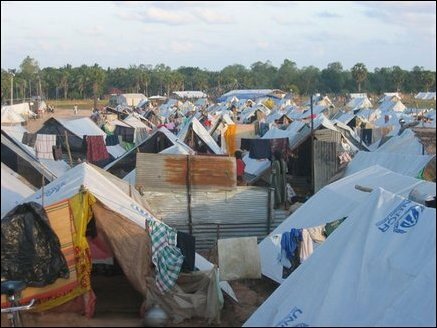 Samiththamby Nadesapillai, president of the fisheries society in Thampattai, said that corruption is rampant, relief supplies disappear overnight and insuffcient aid reaches those who have sought shelter in this camp. 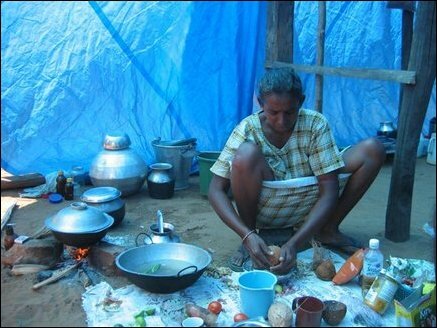 Vincent Daisy (44), wife of a fisherman and mother of two, cooks lunch in a welfare camp in Thampattai in the afternoon. She says she received only rice, sugar and flour from relief workers and have to buy vegetables, chillie powder, onion, green chillies, coconut and other spices at the shop. She earns Rs 300 clearing rubble. 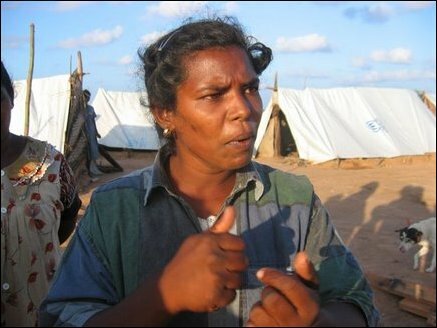 She says she is sick after working for long hours in the heat and finds difficult to make ends meet after her husband lost his job in Tsunami. 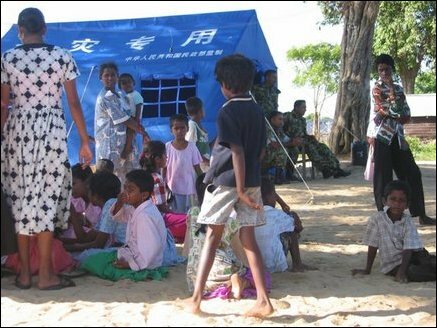 The tent they are living in is very hot that no one can stay inside more than a few minutes. Some camp residents are using coconut fronds as roof to make the tents cooler. 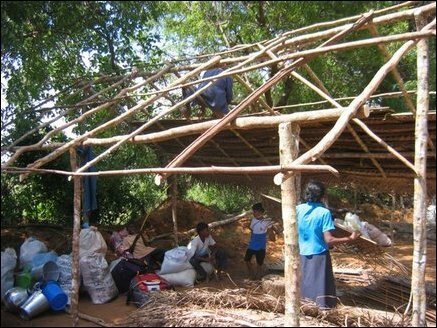 People putting up cooler shelters in Thampattai using cadjan leaves. 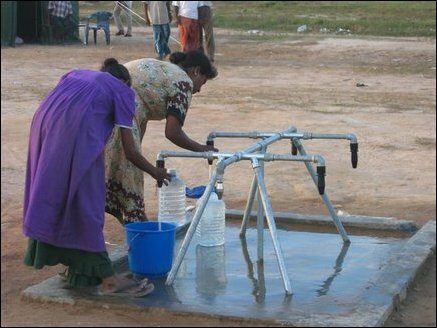 30 years old Kanagasundaram Yogeswary who stays in Mandaanai camp-2 complains that she is not getting enough relief supplies. She has to look after three young daughters and husband. Yogeswary says that even supply of essential items such as sugar is also intermittant as the STF and people from Mandaanai welfare camp-1, which is in front block the relief workers to come to Mandaanai welfare camp two to do distribution saying that people in Mandaanai welfare camp two are not affected. 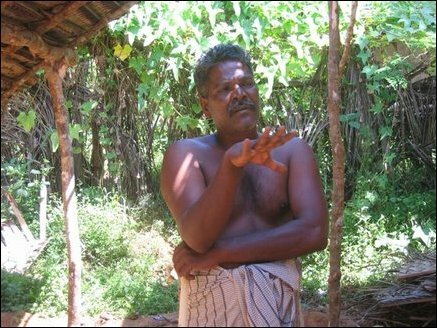 Both the camps are situated in Gayathri temple grounds. 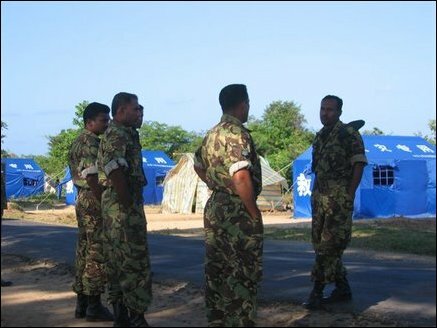 Additional shelters are being erected to transfer poeple from Government buidings. 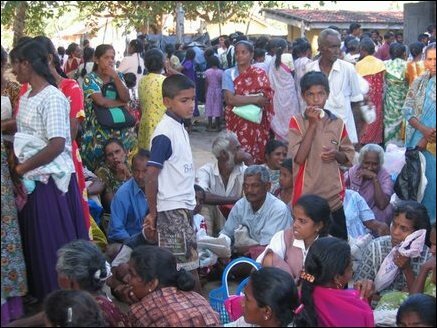 Mandai welfare camp-1, and Mandaanai welfare camp-2 have already more than 1,500 families-more than 7,000 people. 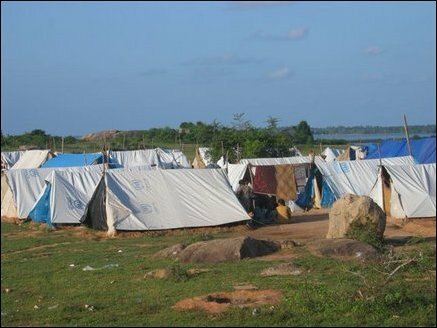 Officials are planning to bring all the temporary camps in Thirukkovil to this place called Gayathri temple compound. 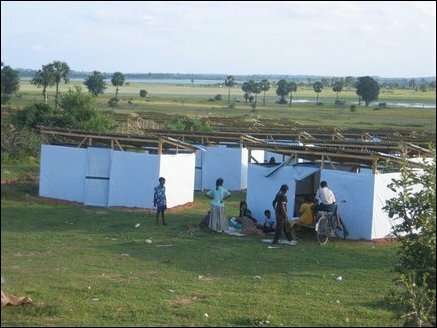 There are ten temporary welfare camps in Thirukkovil divisional secreatariat. 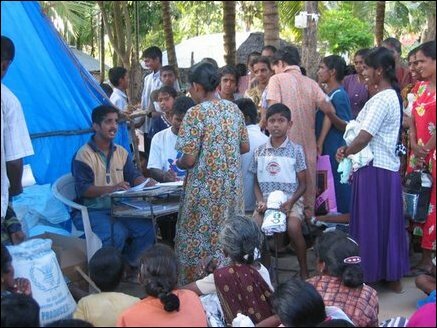 Officers of the Tamils Rehabilitation Organisation filling forms in Mandaanai welfare camp. 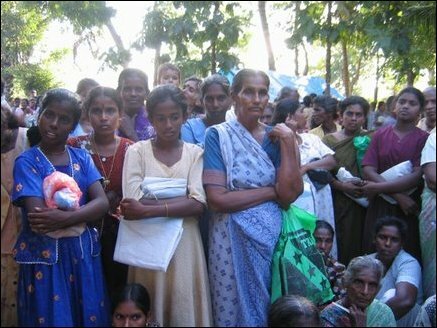 STF distributed relief aids to people in Kottaikallar at Kottaikallar Maha Vidyalayam.